Sublime physical vigor, intelligence, sensitivity and heavenly grace define Michelangelo's David, not only one of the greatest masterpieces of all time, but a symbol of attributes that illustrate the best of mankind. Michelangelo, an artist at the pinnacle of his creative and technical abilities in the 16th century, brought David to life to teach us all how arrogance and brutality will not last in the face of intelligence and courage. 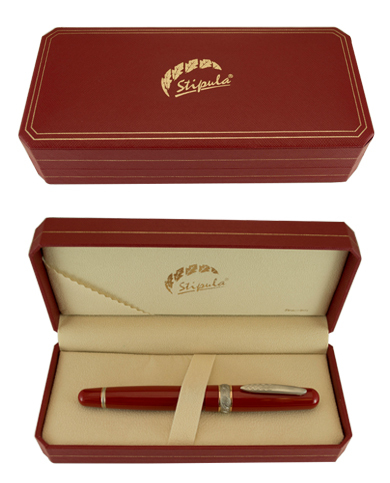 Stipula honors this exemplary story with a new collection of timeless writing instruments: the cast clip of the pen portrays in detail the famous statue of the Florentine master. The center band is embellished with panels depicting four scenes or symbols that illustrate key events in the life of the Biblical David. 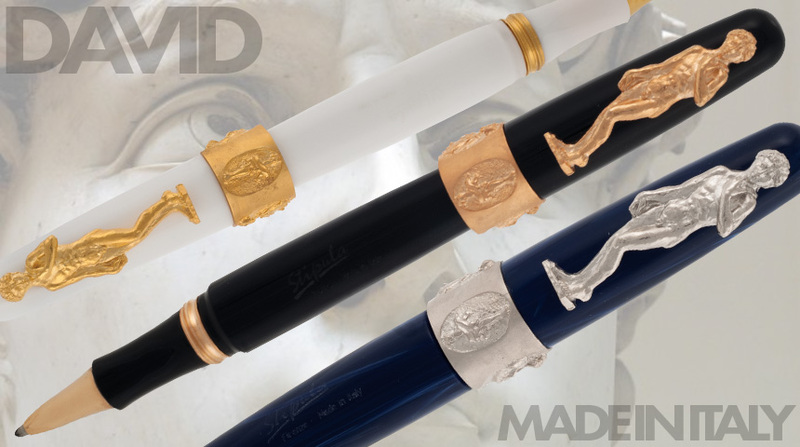 The oversize pens are hand-turned in Italian resins in Blue Marble, Pure White and Black Onyx with plated metal accents of chrome, yellow gold or rose gold. The Italian words 'David di Michelangelo' are engraved on the barrel. 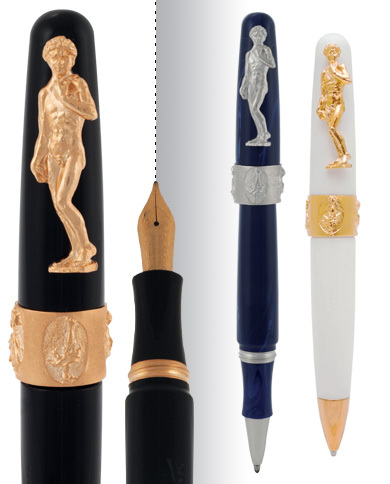 The Statue of David fountain pen is enhanced with a semi-flexible stainless steel nib available in F, M and ITALIC MEDIUM. The collection is completed with a matching capped rollerball and twist ball pen. Cartridge/converter fill.